How would you like to add a special touch to your Valentines this year? I used the Sweet Things Collection to make some "lift the flap" style cards that will be perfect for loved ones of all ages! 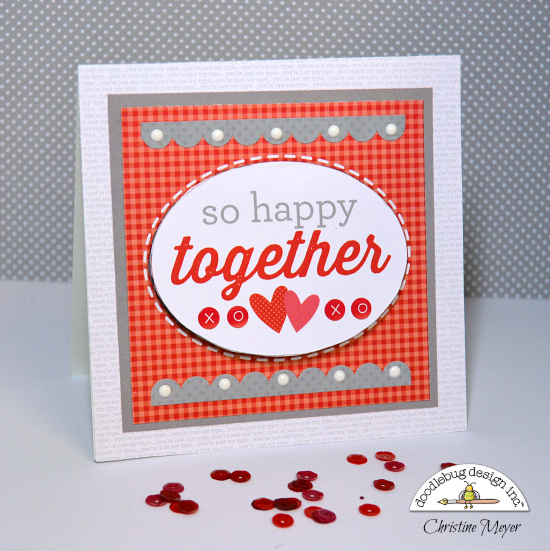 All it takes is a little patience with your craft knife and the right Doodlebug supplies! For this first card I used my craft knife to cut up a part of some of the scallops on the paper. I then tucked a small foam adhesive piece underneatht o make them stand up better. I inked the curves on them lightly with some white ink to soften the edges a bit. I also added Lily White Glitter Sprinkles to those scallops. For the flap I cut all but the top curves of the heart. 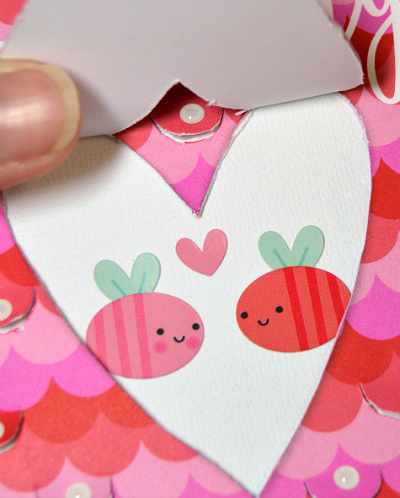 I added the two little love bug stickers inside my flap along with a heart sticker. So happy together was very cute on it's own but I wanted to personalize it a little more. I decided to stick with the gray and red color scheme because I liked that it made it a little more masculine. I used the Sweet Things Fancy Frills to add a gray border as well as some Lily White Sprinkles for dimension. I added xoxo stickers from the Ladybug Red Teensy Type Alphabet Stickers. The flap was created once again with my craft knife and as you can see I cut nearly all of the oval open. 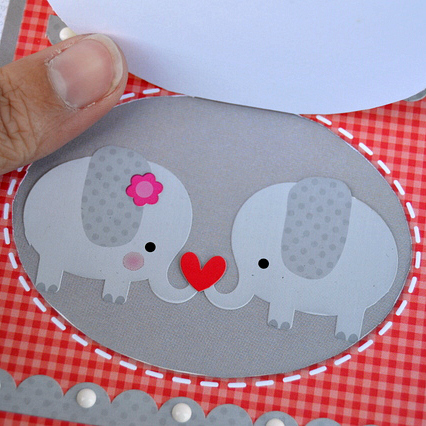 How sweet are these little elephants!?! And of course I had to hook their trunks together with a heart! 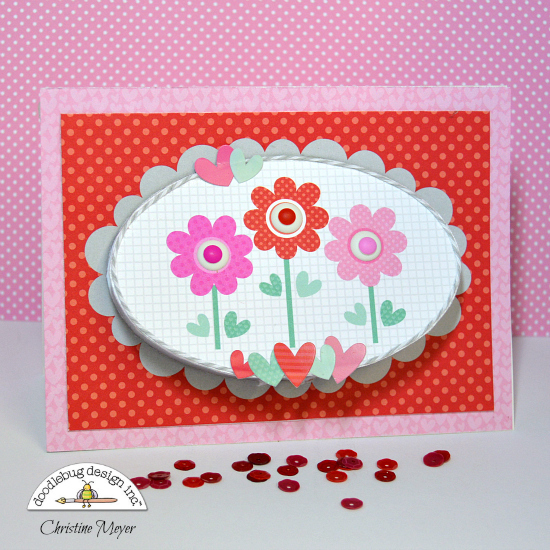 My last card today didn't have a sentiment on the front but instead has some cute Doodlebug flowers! I added some dimension to those flowers by using the Sweet Things Matte Sprinkles layered on top of each other for the center of each flower. I also outlined the oval on this one with Gray Doodle Twine and added some coordinating heart stickers. Since there was no sentiment on the front it had to go inside the flap where I used some of the cardstock stickers to create it. I had so much fun making these and can't wait to share them with some of my Valentines this year! Make sure to check back more this week for tons of inspiration using the Sweet Things Collection! Really like the gray in the card… you're right, just enough to make it a bit masculine. 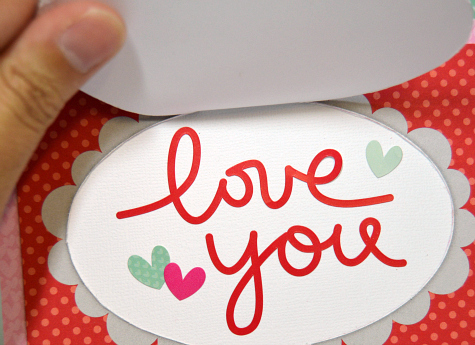 I like that the love card could be adapted for many greetings… but for now, I'm inspired for Valentine's Day. Thanks! Wow! These lift the flaps are awesome! I didn't realize what was underneath in the initial post. Excellent! Simply adorable Christine! 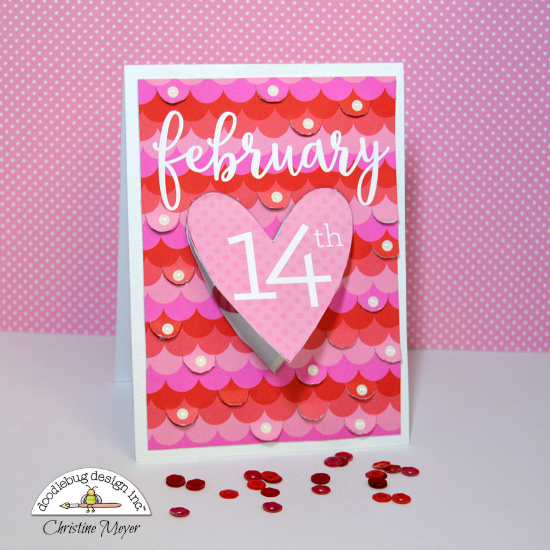 Such a fun idea for card fronts! Love them! These are simply adorable! Love them all! These cards are beautiful!!! ❤️ They are Happy Heart Day perfection!!! You rocked this girl! Can't wait to see what you come up with next! These are so cute....love the little flaps....what a fun idea! Such a cute idea Christine. Love these!! !